How did Lucy get her name? Do you know where Lucy the 3.2 million year old Australopithecus Aferensis got her name from? Lucy was found in many pieces in 1974 in Hadar north-east Ethiopia by a paleoanthropologist, Donald Johansen. 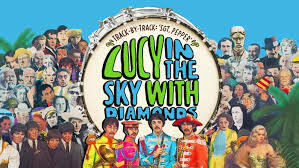 When the expedition returned to camp after working at the recovery site, the Beatles “Lucy in the Sky with Diamonds” was playing. And so AL 228-1 became known to the world as Lucy. Apart from the fact that she is over 2 million years old, do you know why Mrs. Ples has a damaged skull? Robert Broom, who excavated Sterkfontein intermittently from 1936 to his death in 1951, had a slightly drastic way of dealing with sensitive and precious fossil sites – with dynamite and a pick-axe. Because of this Mrs. Ples’ skull was blown into 2 pieces and some fragments are missing. Miraculously Mrs. Ples is still one of the most perfect pre-human skulls found to date. And Mrs. Ples might well be a Mr. Ples. Her name comes from the initial scientific name that Broom gave her: Plesianthropus transvaalensis (near-man from the Transvaal), before she was later subsumed into the species Australopithecus africanus. Little Foot is, to date, the most complete skeleton of an Australopithecus. But he was not found that way. 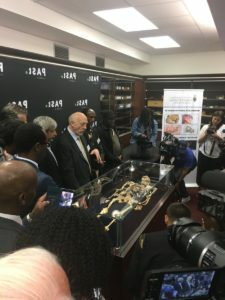 It took over a century and a quarter to identify the bones that now make the nearly 90% complete skeleton which lies in state at the Primate and Hominid Fossil Laboratory at Wits. Little Foot’s story (as a fossil) begins in the gold rush days of the late 19th century when the importance of lime in the gold extraction process meant that there was major blasting activity in the Sterkfontein area. One of these blasts in the Silberberg Grotto exposed fossil bones. 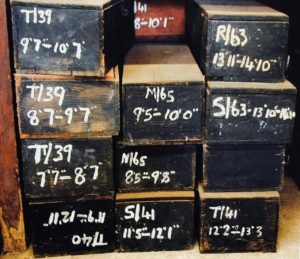 Eight or nine decades passed and in 1980 some of the ‘monkey’ bones exposed by the blasting, were collected and boxed with other animal bones. In 1994 Professor Ron Clarke was going through a box in a Sterkfonten workroom when he came across the 4 foot bones and realized that rather than being bones from a monkey, they were from an Australopithicus, later named Stw 573. In 1997 Ron Clarke found more bones in a box of monkey fossils. Included was a 2nd tibia i.e. the shin bone of a 2nd leg which made Ron Clarke realize that the rest of the skeleton must still be in the cave. And here is where the story gets even more miraculous. He made a cast of the broken shin bone and asked his assistants Stephen Motsumi and Nkwane Molefe to look for the other piece of the broken tibia. And lo and behold, with hand held lanterns, they found the matching bone in only 2 days, embedded in the breccia deep in the cave. It took Clarke and his team another 20 years to fully extricate, clean, and analyze Little Foot who was finally installed in the Fossil Laboratory at Wits in 2017. 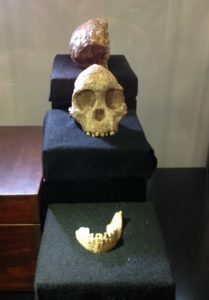 When I worked at Wits the story was that Phillip Tobias kept the Taung skull in his office drawer. 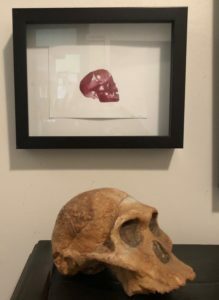 While I doubt that this is exactly true, it is clear that this extraordinary priceless hominin fossil has not always been kept behind strengthened glass in a special vault. In 1929 , five years after Raymond Dart had identified the Taung skull as that of an Australopithecene, he took it to London to have casts made. He had to return to South Africa unexpectedly early and so it was left to Mrs Dart to return with the precious cargo. On her last evening in London she left the box with the skull in a taxi. The horrified cab driver thought it was a baby’s skull! But fortunately police were alerted and the skull was brought safely home by Mrs Dart. Rather a photo of a book about Prof Tobias, than a photo of upper bilateral diastema!! 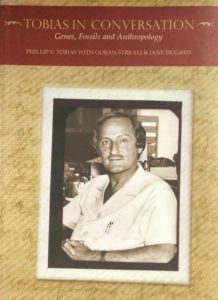 And finally a story against myself and NOTHING to do with fossils but to do with a man who is a luminary in the field of paleoanthropology – Professor Phillip Tobias. Many years ago I was writing a history report on the National Health Laboratory Service (NHLS) [the old South African Institute of Medical Research (SAIMR)] for a heritage impact assessment. As the Wits Anatomy Department was closely connected to the Institute, I needed to interview Prof Phillip Tobias. He was delightfully mild-mannered and olde-world, asking me to pour the tea for us which had been brought in on a tray by his assistant. After a wonderful session with him, I got up to say good-bye. He fixed me with a twinkly eye and said: ‘Now tell me my dear – who in your family has upper bilateral diastema?’ Determined not to show my ignorance, I grappled with the ‘upper’ and the ‘bilateral’ parts for a few seconds and then, combined with where he was looking, was able to say “My father had a gap between his teeth, but his was smaller’. I was exceptionally proud of myself! !